For some reason, even though Katrien is half-Asian, which is one half more than I am, I've become the designated fried-rice maker. I guess it's because I've hit on this method that seems to work every time. 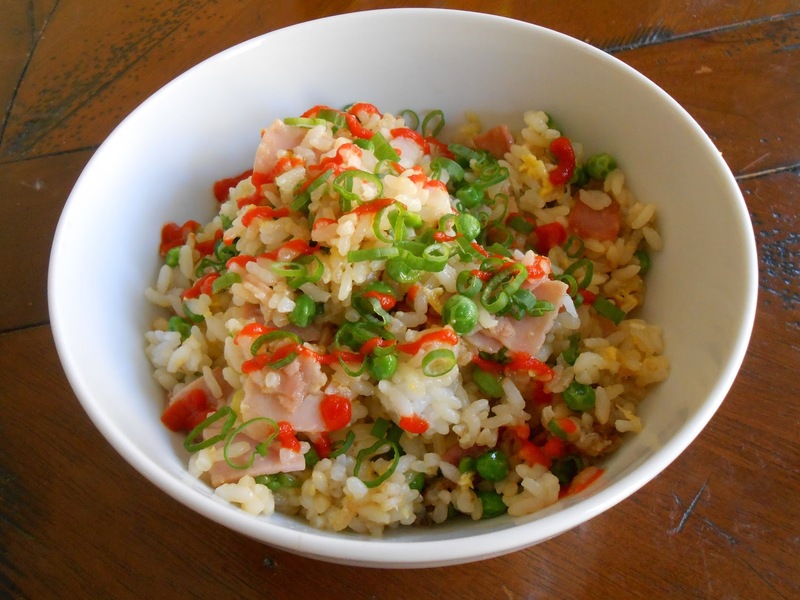 We've made it with everything--Chinese sausage, chicken thighs, even lobster--but this version with ham and peas is the most basic and maybe the best. For a more luxurious presentation, cook the eggs sunny side up and serve over the rice instead of cooking everything together. 1. Heat canola oil over medium-high heat. Add ham and brown, about 3 minutes. 2. Add frozen peas, scallion whites, and salt. Sweat until soft, about 2 minutes. 3. Add rice and cook over medium-high heat until grains separate and are lightly browned, about 4 minutes. 4. Add eggs and soy sauce and cook over low heat just until eggs are incorporated into the rice. 5. Scoop into bowls and garnish with scallion greens and Sriracha.